It is estimated that the world's population will reach 9.7 billion by 2050. This presents a huge challenge: how to feed this many people. This problem can be addressed in a variety of ways: increasing production and sustainability through new technologies and practices, preventing food waste, and changing our diets and behaviours towards consumption. 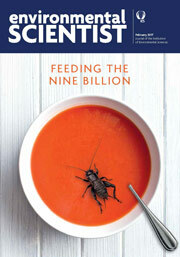 Featuring discussions on topics ranging from smart farms and soil research, to case studies of 'super foods' and successful food waste charities, this issue of the environmental SCIENTIST seeks to explore some of the interconnected challenges of feeding nine billion people. Innovation in thought, technology, policy and practice will play a crucial role in tackling food security in the coming decades, and we hope the case studies presented here will provoke further discussion and provide some insight.